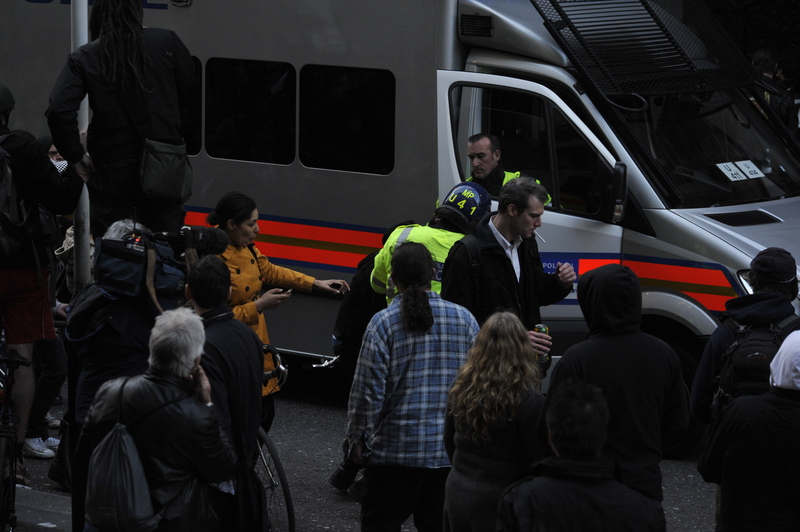 ← PC Simon Harwood responsible for Ian Tomlinson’s death? However, Harwood insisted that “from his angle”, the 47-year-old had not been moving away. “That is rubbish, I suggest to you, PC Harwood, and you know it,” said Ryder. “I was there and I saw what I saw,” said Harwood. In an earlier statement, the officer had maintained that Tomlinson was “almost defiant in that his hands remained in his pockets and he looked at police officers approaching him as if he was simply intent on remaining where he was”. He stood by that claim in his evidence today, despite being reminded by the acting deputy coroner, Judge Peter Thornton QC, that he need not answer any question that tended to incriminate him. Harwood again responded by saying that he was “here to help” – a claim that reduced family members, including Tomlinson’s widow, to tears. Harwood also accepted that he had not given Tomlinson any warning before pushing him and told the court that he believed that he was entitled, as a police officer, to strike someone even if he had judged them not to pose a threat. Ryder asked: “Does your training tell you if someone is not a threat to you or any other person it is acceptable to baton them? Is that your training? “Yes,” replied Harwood. He also said that he did not consider his push to be any harder than that of a fellow officer who had pushed Tomlinson seconds earlier. Another officer, however, had described Harwood’s push as being “in a different league of force”. Harwood said he had not expected Tomlinson to fall to the ground as a result of the push. “Someone who has his back to you, you push him with that force, from behind and you didn’t expect he might fall to the ground?” asked the barrister. “No it is not,” replied Harwood. Ryder then asked if he had been trying “to make an example of” Tomlinson. 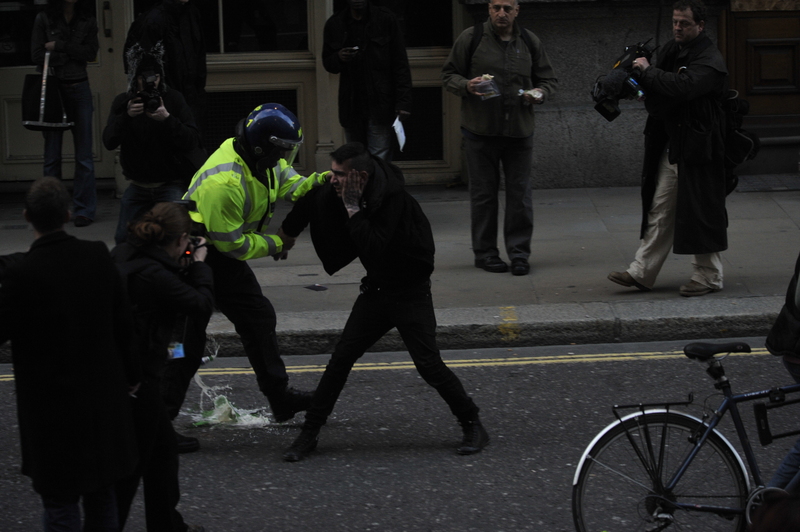 The police officer who pushed Ian Tomlinson minutes before he died at the G20 protests in London said he was “almost inviting a confrontation”. 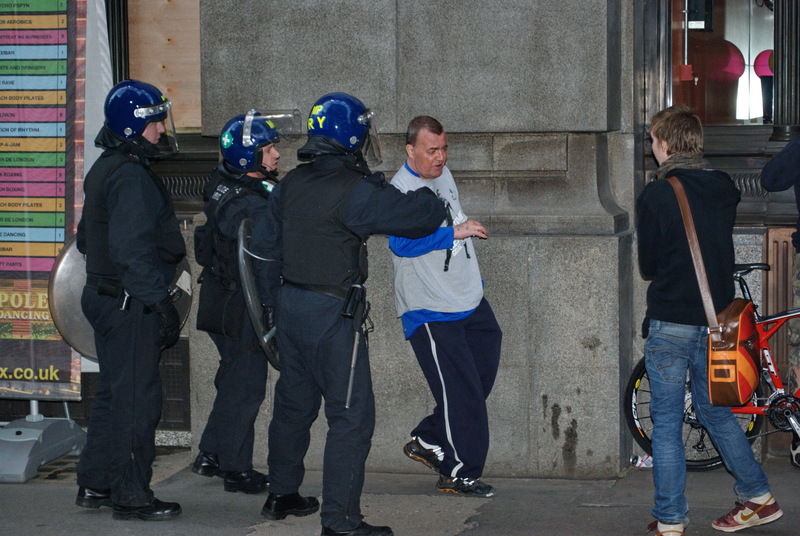 Pc Simon Harwood stood by his statement in which he said Mr Tomlinson’s posture was “almost defiant”. The jury at the inquest into his death was again shown footage of Pc Harwood shoving the 47-year-old as he walked away from a police line. The Tomlinsons’ lawyer accused the officer of lying and talking “rubbish”. Giving evidence for the third day, Pc Harwood said he had not expected the newspaper seller to fall over and he had not helped him while he lay on the ground because it was not part of his training. 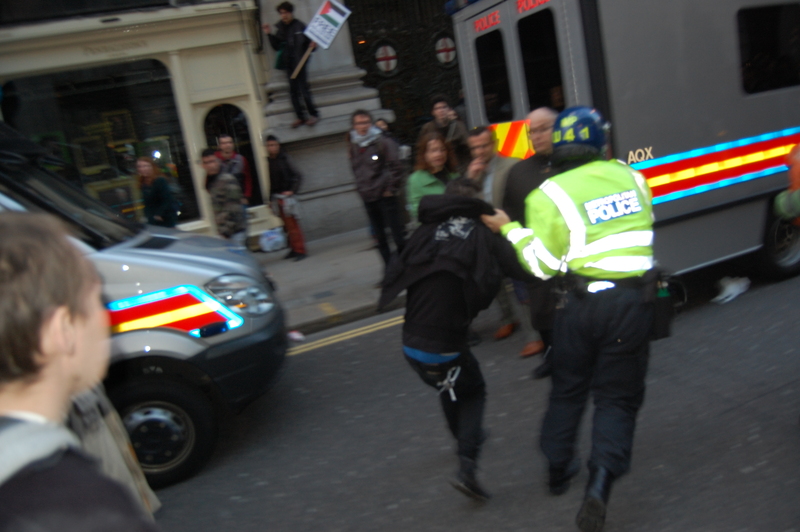 When asked later by his lawyer if he had intended to hurt Mr Tomlinson, he appeared to wipe tears from his eyes as he replied “not at all, no.” Pc Harwood, part of the Metropolitan Police’s specialist Territorial Support Group (TSG), was caught on film pushing the newspaper seller to the ground in Cornhill, central London, on 1 April 2009. Mr Tomlinson got back to his feet but collapsed and died minutes later. Mr Tomlinson, who was not a demonstrator and had been selling newspapers in nearby Fish Street Hill, was on his way home when he encountered the protests. On Wednesday, the officer was challenged over claims in his statement from 2009 that the father-of-nine had been inviting the confrontation and his push had been just a “gesture”. “He (Mr Tomlinson) just looked as if he was going to stay where he was whatever and was almost inviting physical confrontation in terms of being moved on,” the statement said. In another part of his statement, he said: “His (Mr Tomlinson) posture was almost defiant. His hands remained in his pockets, he did not move away, and he looked at the police officers approaching him as if he was simply intent on remaining where he was.” Pc Harwood, who is suspended from the force on full pay, has been told he will not face any criminal prosecutions over what happened – but he is still facing a Met Police misconduct hearing, due to take place after the inquest. 10.20am: Fair exchanges are as frosty as they were yesterday. Ryder has asked for video footage showing the crowd at the time he made his attempted arrest. Ryder says the footage shows that Harwood’s carrier was “the safest place you could be at that time” (after the arrest), and points out that his colleague, PC Hayes, was able to return to his van. 10.39am: Another clip, showing Harwood clashing with BBC cameraman Tony Falshaw. The inquest has already heard that Falshaw said he was pulled to the ground. Ryder: “You took hold of him and pulled him to the floor, didn’t you? Asked by Ryder if he was “shocked” the cameraman fell to the ground, Harwood said he could “not recall”. 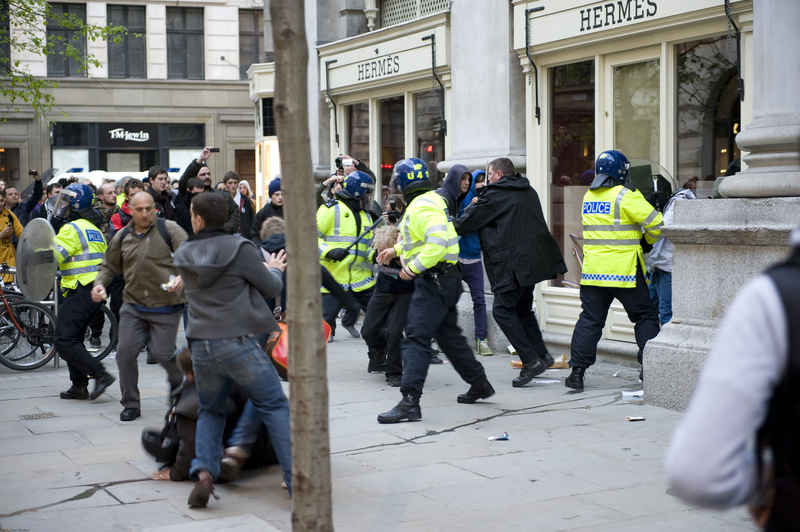 11.04am: Seconds later, and according to Harwood’s initial log book, he became surrounded by protesters. The video footage appears to contradict this. There are a number of bystanders in front of the officer, some metres away. Ryder: “Do you know what surrounded means, PC Harwood? Harwood: “In my own way, yes. 11.19am: Harwood is now being shown snippets of police helicopter footage which he has not yet seen. The officer initially refuses to answer questions until he sees the video in its entirety. The aerial views show the scene from above. Ryder says the footage shows how easy it would have been for Harwood to return to his van, which he had not been expected to stray from on the day of the G20. Ryder: “You were more interested in being away from your carrier, with other officers, in the middle of it, weren’t you? 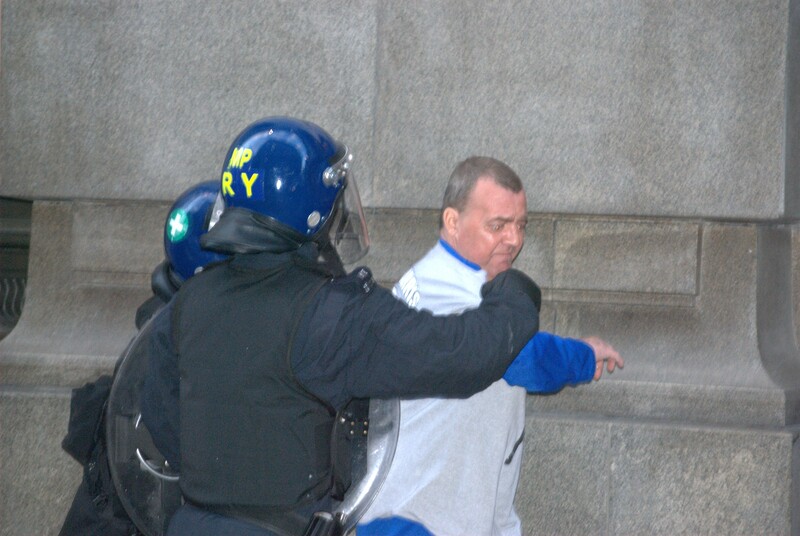 11.52am: The jury is now being shown footage from Royal Exchange Buildings, in the seconds leading up to the moment PC Harwood confronted Ian Tomlinson. Ryder says he is showing the video to give a sense of the atmosphere at the crowd. 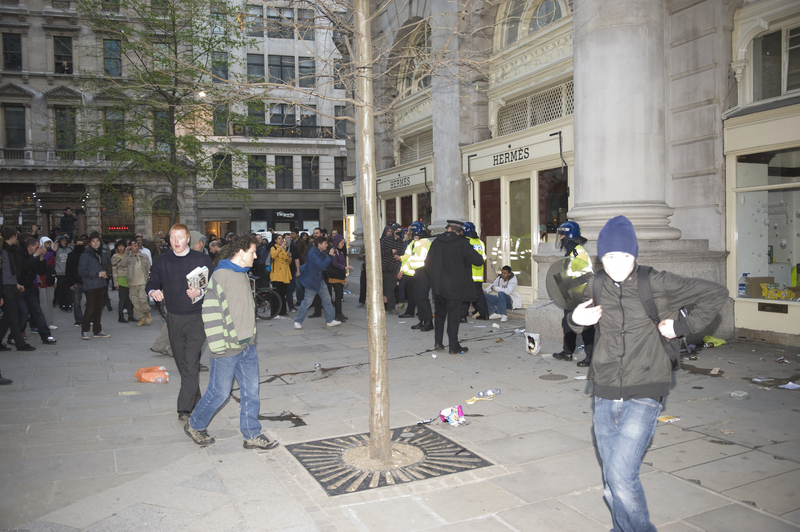 The coroner intervenes to ask if there is at any stage “confrontation on the line” along Royal Exchange Buildings. Harwood replies: “No”. 12.04pm: Ryder has now begun talking about Harwood’s claims about Tomlinson’s movements. Previously, he said he struck Tomlinson because he was “encroaching” a police line. The inquest is then shown CCTV from a shop window. The lower half of Tomlinson’s body can be seen. He is first standing by a bike rack, and then walking away from police. 12.14pm: Harwood’s evidence yesterday was that he used force against Tomlinson, because he was refusing to move away from the police line. Retracing snippets of video, Matthew Ryder is suggesting that the newspaper vendor was moving in the direction police wanted him to go. The footage shows Tomlinson moving slowly, but continuously, away from police in a south-westerly direction. Ryder said this showed Tomlinson was clearly not moving toward police. The exchange continues in this way, until Ryder again accuses Harwood of lying. Ryder: “I am asking you what’s right in front of you. Do you agree at the time you pushed Mr Tomlinson he had his back to you? PC Harwood, do you want to change your answer? 12.55pm: Harwood is now attempting to explain the lawful power he believed he had been exercising – entitling him to use force against Tomlinson. After some exchanges in which Harwood is asked to cite the law, but appears unable to, he settles on “breach of the peace”. Harwood accepted Tomlinson posed no threat to him or anyone else. 1.09pm: Ryder is now asking why Harwood did not record his baton strike and push of Tomlinson when he wrote up his notes about 40 minutes later. In a bid to explain this, Harwood said he recalled general events of the day and “couldn’t remember” the incident with Tomlinson. 1.14pm: The last few exchanges concerned the fact Harwood did not go to Tomlinson’s aid after he struck the ground. The inquest has heard from another officer who was standing nearby who said she believed the fall was so hard she expected there to be blood. Ryder asked Harwood why he did not go to the newspaper seller’s assistance to check he was OK.
2.10pm: Matthew Ryder says he has finished his cross-examination of PC Harwood. Ms Samantha Leek, counsel for the Metropolitan police, is now questioning him. She said her questioning would focus on briefings and training received by the police officer. 2.14pm: Leek is talking through the Met’s “conflict management model”, which sets out when reasonable force can be used. Harwood initially appears not to know about this model. She also refers to the Association of Chief Police Officers’ manual for public order. Again, Harwood does not seem to be very aware of this document. Harwood states that Tomlinson was encroaching a police line, to which Leek replies she is talking in general terms. 2.22pm: Leek is focusing on this point. She said that the training states there are a number of options for an officer to consider using force, including doing nothing, warning somebody verbally and to “usher them away gently”. Harwood repeatedly states that he was going by the training he received at Gravesend (the Met’s Kent-based public order training centre). 2.30pm: Evidence is now being taken on the briefings given to Harwood ahead of the protest. 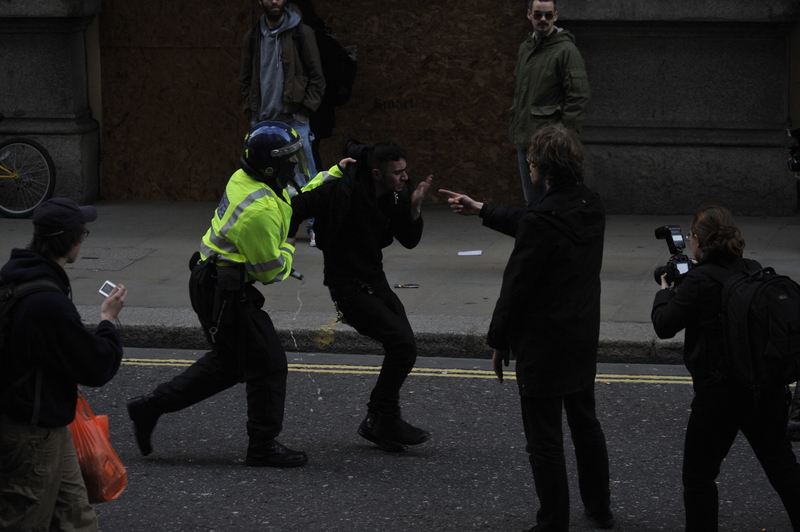 Leek said that “at no point” was Harwood told that he would have to use force at the G20. After some exchanges, Harwood concedes that he was aware that force would not necessarily have to be used. One of the briefings Harwood received was from his territorial support group sergeant, Emma Shaw. He was in the driver seat, behind a partial screen, and she was standing in the middle of the vehicle. Previously, he said he could not hear the briefing, and told his sergeant this. Leek points out that the sergeant’s testimony to the jury contradicted this. Leek has finished her questioning. 2.31pm: Patrick Gibbs QC, Harwood’s counsel, has started questioning. He said Harwood had been “under interrogation” for almost 10 hours, and asked him how difficult it had been to disentangle his memories from this consideration after watching footage and images. Harwood replied it was “almost impossible” to tell the difference. 3.59pm: Harwood’s lawyer Patrick Gibbs is taking the officer through the video footage significantly more quickly than Tomlinson’s family barrister did earlier. Harder to keep up. We’ve now reached footage of the incident itself. We have heard previously that police are instructed to remain behind dog officers, but Harwood had to step in front of them to strike Tomlinson. Under questioning from Gibbs, Harwood says that he was not the only officer to step “in front of the dog officers”, but there were at least two others in similar positions. Harwood’s voice is appearing quite strained now – like a stage whisper. 4.32pm: Judge Thornton has now begun asking Harwood questions. MS LEEK: PC Harwood, I ask questions on behalf of the Metropolitan Police Service. I have two specific areas I want to deal with you with, and those are training and briefings. I will start with training. The first is a small point. At the beginning of your evidence, Ms Hewitt put to you that your last training session was in January 2004. I just want to put that straight. For the record, it was, in fact, January 2009, wasn’t it? A. Sorry, yes, it was. Q. So you had had refresher training just a few months before this incident? Q. As far as training is concerned, when you join the police force you undergo basic officer safety training; is that right? Q. And that basic officer safety training deals with all aspects of the use of force? Q. It teaches you what your powers are, with regard to the use of force? Q. And it teaches you about the extent to which you can use force in certain situations? Q. You are taught about something called the conflict management model? Q. And within the conflict management model, you are also taught about something called the continuum of force, are you not? Do you remember that? A. I can’t recall that. Q. Okay, we will deal with the conflict management model. The conflict management model is a model which enables officers to determine the extent of the use of force that they are going to use; yes? Q. Do you accept that? A. If you can tell me a little bit more. Q. Have you forgotten? It has probably been a while since you have thought about this? Q. It teaches you to take on board information and intelligence in order to assess the level of threat towards you? Q. Once you have assessed the level of threat towards you, you can decide how much force you need to use in a particular situation? Q. That applies whether there is a risk to you or to somebody else? Q. You actually underwent advanced training, I think, in all of these aspects, because you were a level 1 trained officer? A. In respect of …? A. As far as I am aware, I thought that was the same for advanced officers and level 2 officers. Q. It meant that you underwent further refresher training; yes? A. More frequent refresher training, yes. Q. Yes. And you were trained by reference also to the ACPO manual, that is the Association of Chief Police Officers’ manual, guidance on keeping the peace? A. I don’t recall that one. Q. The public order manual? A. Not off the top of my head, no. Q. 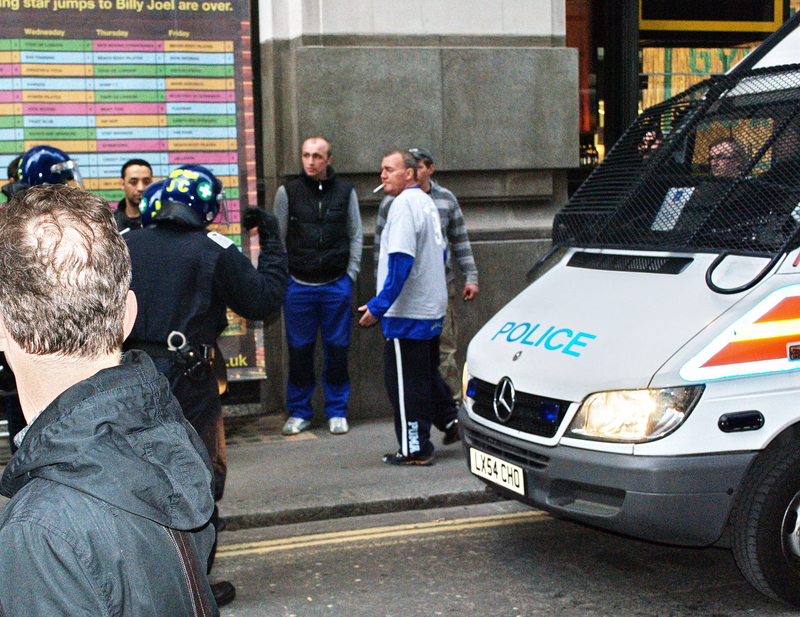 You are entitled to use reasonable force in self-defence or defence of another? Q. 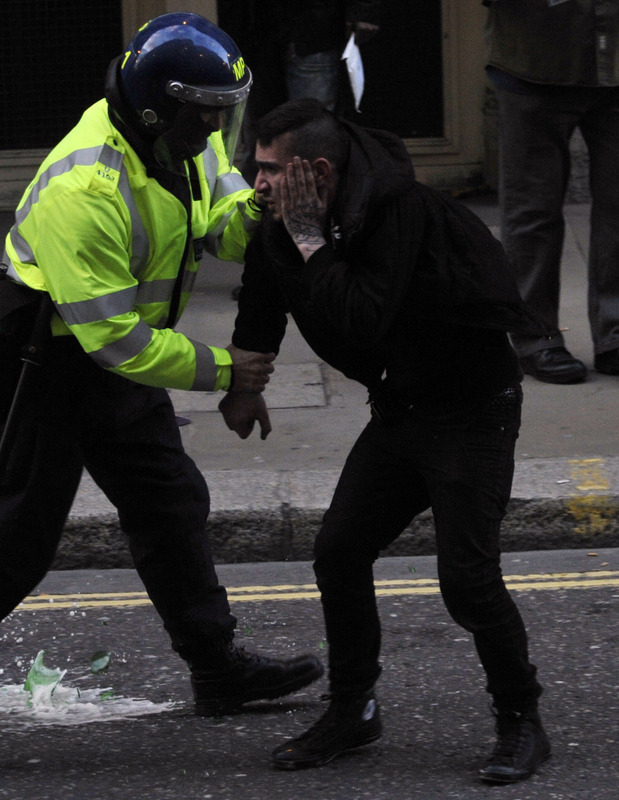 And you are entitled to use reasonable force in exercising a power under the Police and Criminal Evidence Act? Q. Those essentially are where your powers come from to use force as a police constable? Q. As far as the use of a baton is concerned, any use of the baton which constitutes an exercise of force must come within one of those powers? Q. You have been taught and refreshed that the level of force should be proportionate to the threat? Q. So even when senior officers require you to draw a baton, or to advance with your baton drawn as part of a dispersal tactic, the decision to strike remains with the individual officer? Q. And that decision must be justified in the circumstances? Q. That is your training? JUDGE THORNTON: By “justified”, do you — I am not going into the law, but the use of a baton is an assault, unless justified under the law. MS LEEK: Quite, sir, yes. JUDGE THORNTON: So that is what you mean by “justified”. MS LEEK: Yes. You said in evidence: “My training tells me that, if somebody is not a threat, I can baton them.” A. That is what I said, yes. Q. When can you baton somebody, if they don’t pose a threat at all? 3 encroaching the police line. Q. That is what you said? 17 what you are asking me to explain. Q. That is a consideration? 20 gently, depending on what they are doing? Q. You could simply take hold of somebody by the arm? Q. Or you could use a baton strike. 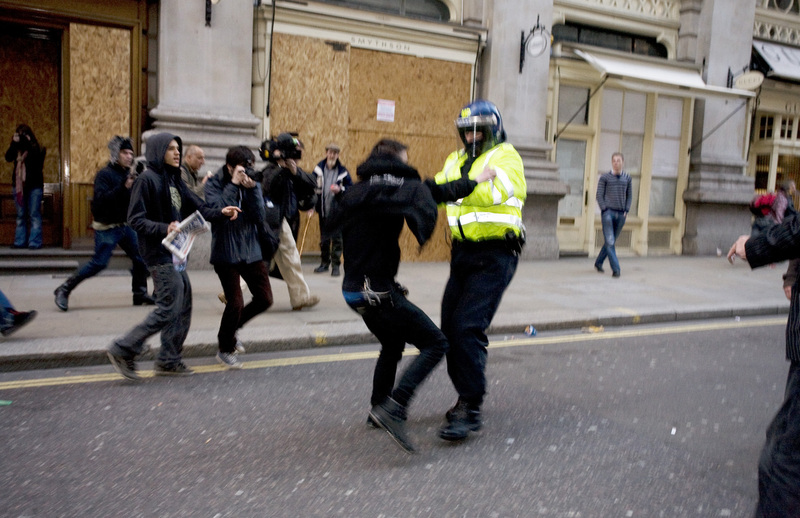 Please tell me where in your training you are encouraged to strike somebody with a baton when they are not posing a threat or are simply approaching a police line? A. 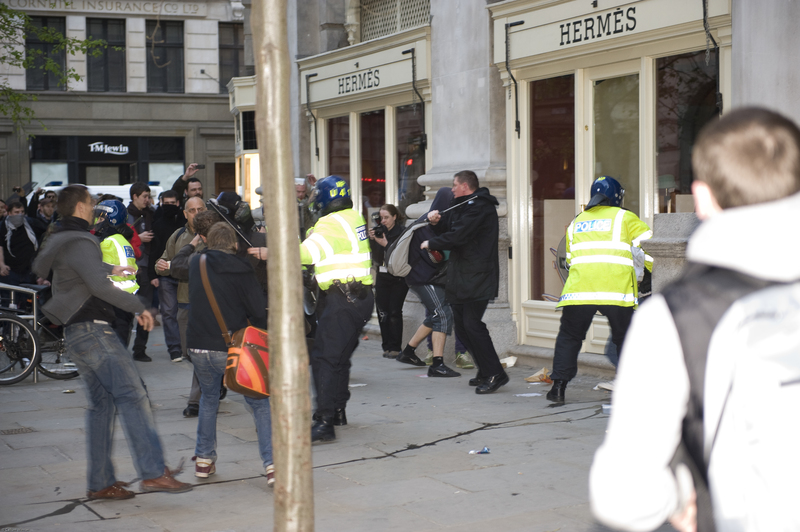 As I have already said, this is what the training we are shown and encouraged to, public order training, in Gravesend. Q. To use a baton strike before considering any other method? Q. That is not what I am asking about, is it, PC Harwood? A. Can you ask me what you are asking me about, then? Q. Are you saying that, in certain circumstances, you may use force in order to enforce a power, is that what you are saying? Q. But do you accept that all of your training has taught you that the level of force must be proportionate to the threat? Q. Thank you. You also mentioned this morning that you are not trained to administer first aid after using force; is that right? A. I don’t remember mentioning first aid. I mentioned something along those lines. Q. About seeing if somebody was okay? Q. 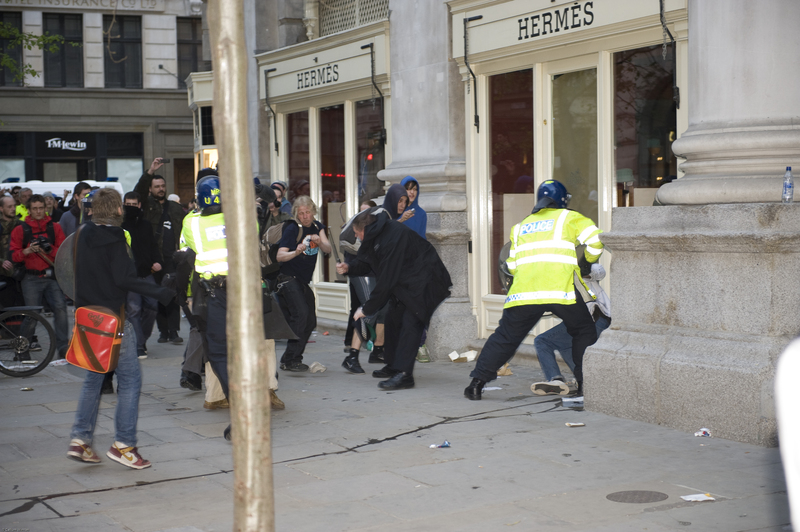 Is it not right that part of your training, particularly in relation to the use of batons, is to consider whether somebody may have been injured? A. As one example, yes. Q. And is it not part of your training that you have to consider aftercare if you have used a baton? Q. If possible. And if possible, in deciding whether something is possible, you will consider whether there is a risk to you, other officers or members of the public in going forward to administer that aftercare? Q. I just want to move on to briefings now. You said yesterday that you had forgotten the briefing with Inspector Williams. I think you said initially that you had forgotten the briefing with Inspector Williams; do you remember that? A. I believe so, yes. Q. Then you were reminded, I think, that you had had a briefing with Inspector Williams; do you remember that? Q. 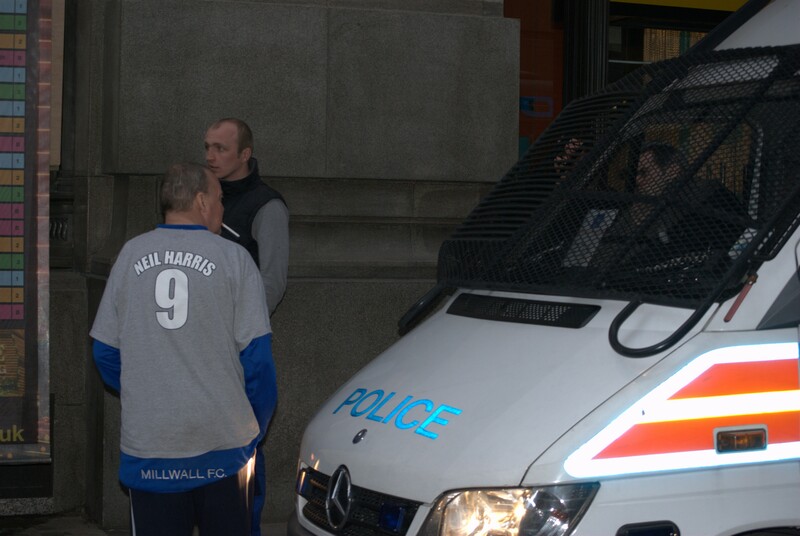 So do you accept now that you had a briefing with Inspector Williams early in the morning on 1 April? Q. And that, first of all, there was a briefing with all of the officers from the three carriers? A. I remember being in company with two other officers whilst talking to the briefing officer. Q. Right. Are you saying now that you can’t specifically remember the briefings, but you accept, if Inspector Williams says so, that you did have a briefing? A. I accept that Inspector Williams spoke to myself and two other officers in relation to a briefing. Q. Right. Do you remember that he spoke to the whole group of officers first before he spoke to the three of you separately? A. No, I wasn’t aware of that. Q. Have you forgotten that now? A. I am not saying I have forgotten it. I am saying I wasn’t aware of it. Q. When you say you weren’t aware of it, do you mean you weren’t in any briefing or you are not now aware that you were in a briefing? A. As I understand, you asked me a question about other officers being present, and I have just answered there were two other officers present when I was spoken to by Mr Williams. Q. Do you remember who those two other officers were? A. Sitting up here now, I can’t recall them, no. Q. Is it fair to say that, at the end of your briefing from Inspector Williams, you were aware that the aim was that the police were to facilitate lawful protest? A. As far as I recall, yes. Q. And that you were to deal robustly with criminal activity? A. I remember the word “robustly”, yes. Q. Robustly with what, can you remember that, or can you just remember the word “robustly”? A. I just remember the word. Q. Okay. At no point were you ever told, were you, that you would have to use force? Q. Because as you knew then, and as you know now, it is never the position that you are told in advance that you have to use force. 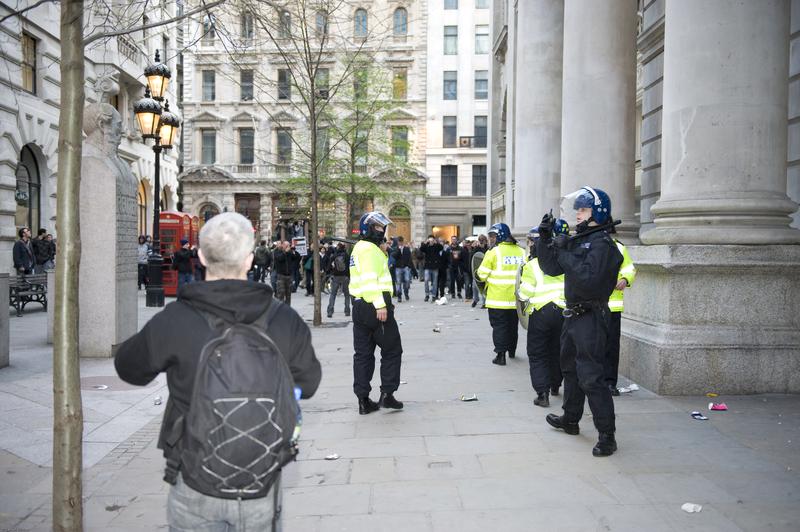 A. I was aware from other officers that that had been mentioned at a public order training day. Q. You were not briefed at any point, in relation to this event, that you would have to use force, were you? Q. You were also aware that dealing robustly with offenders does not mean that force will necessarily have to be used? Q. And that you have to make your own judgment as to whether to use force and the amount of force to be used in the circumstances as they present themselves to you? Q. You were also told that it was anticipated that it would be a large demonstration, but it was not known if the protest was going to be violent. Do you remember that? Q. That is what you were told by Inspector Williams? Q. But you were told that there was a potential for hostility? Q. But given the previous protests that you had been involved in, and given your training, you would know that in any event, is that right, that in a demonstration of this nature there is the potential for hostility? Q. — as we heard yesterday? You were sitting in the driver’s seat? Q. And Sergeant Shaw was standing on the ledge at the side of the vehicle. Is that right? A. I can’t remember where she was. Q. Is it right that the screen behind you is a partial screen, it is not a full screen? A. It is a full screen, in terms that it goes from — there is a partition from the roof to the floor of the carrier. Q. Behind you, there is a screen that goes from the floor to the ceiling, but it is not right across the vehicle, is it? It is a partial screen, in that sense? A. It is partial to the fact it will come to my left, yes. Q. Yes. You said in evidence that you turned round to Sergeant Shaw and said: “I can’t hear.” Do you remember that? Q. Is it that an assumption that that is what you would have done, or do you actually remember that now? Q. Because Sergeant Shaw, in her evidence, said this — sir, for your reference, it is Day 3, page 218, line 7: “Question: Did he give you any indication that he couldn’t hear anything?” I asked her that question and she said: “Answer: No. “Question: At any point, did he ask you to clarify what you had said?” And she said: “Answer: No.” Now, thinking back to that day, Officer, there is an awful lot that you now think that you can remember because you have been asked, because you have looked at footage, and it is two years ago, but you haven’t said anywhere else beforehand that you asked her to clarify anything she said, or that you gave her any indication that you couldn’t hear. So are you sure that is not an assumption, rather than what you actually now remember? A. No, it is not an assumption. Q. When you said to her that you couldn’t hear, did she repeat what she had said? Q. You could hear her talking? A. — but there was lots of talking by other officers on that carrier. Q. If you thought it was important to find out what she was saying, you would have repeated that you couldn’t hear, wouldn’t you, until she told you specifically what she had to say? Q. Yes. In any event, you were in no doubt as to where you had to take the carrier at that point? Q. What the aims of the policing were? Q. And what your role was? 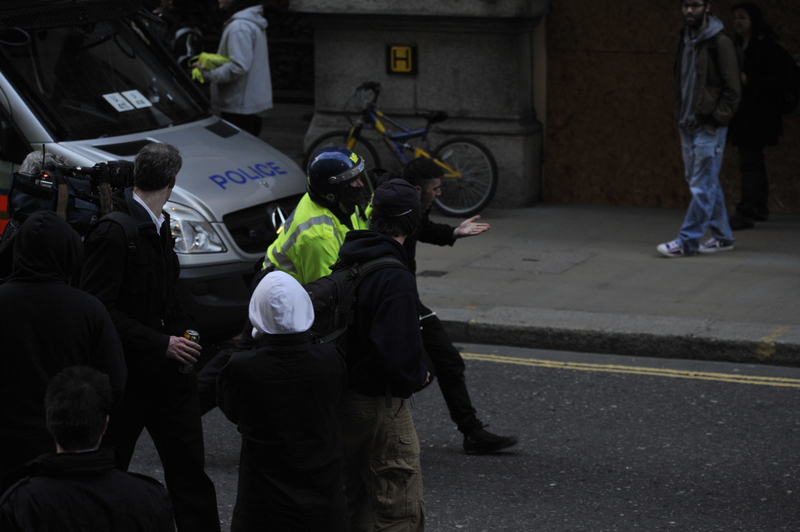 MR BRANSTON: Officer, I ask questions on behalf of the City of London Police. It is a very small point. The jury, if they don’t already have it, I think are going to be given a 32-page statement that you prepared on 9 July 2009, and it is one very narrow issue that you raise in there that they will in due course read. Sir, for your note, I am at page 23, at the top of those paginated pages. Officer, do you have that? Q. It is the second paragraph down. Ms Leek, on behalf of the Metropolitan Police Service, asked you briefly to confirm, which you did, that, in essence, a senior officer cannot give you an instruction to use force, the decision always rests with the individual officer. Do you remember — I paraphrase, but do you remember giving that evidence? Q. Can I just confirm that, even if — and for the record, it is not accepted that this was said — but even if you say here you heard a dog handler shout “Someone baton him”, can we just agree, Officer, that even if that was said, that had no bearing on your later action. Is that right? MR BRANSTON: Thank you very much.